Music Stories are like Sports Stories, but instead of sport players and teams trying to win games, the Music Stories are about musicians or music groups trying to overcome challenges related to performing music or using musical activities to solve other problems in their lives. Series about the every day lives of a fictional or fictionalized music star might also be considered Music Stories or partial examples if musical performance is a regularly featured element of the story. Sometimes the music group also gets involved in non-musical adventures that may cross into other genres, however musical performances will still play a major role. 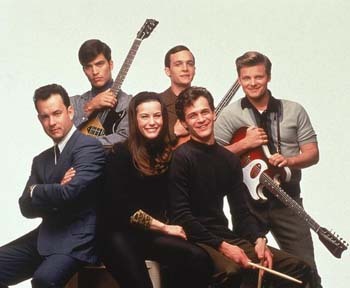 Some of the many common plots include individuals or bands trying to make it big in a competitive and sometimes hostile music industry, music teachers trying to make a difference in the lives of their students either in an established music group that has declined or by creating a new music group, fictionalized Biopics about historic Real Life musicians and composers, and kids (often troubled) pursuing their musical dreams by joining school choir or band, and then trying to balance their musical training with their academics and personal life. Sometimes the existence of the music group might be threatened with a funding cut that would destroy it, and the musical group must revitalize and revamp itself in order to impress the powers that be with their newfound talent and popularity to retain their funding source. Other times the music group might be raising money for a charity outside of itself. Unlike The Musical, dialog and exposition is not told primarily through song, and characters mostly confine their music to performances and practicing rather than, say, spontaneously breaking out into an elaborate choreographed song and dance number during their high school lunch break. Music Stories are mostly not musicals, but a few musicals are Music Stories because their plot centers on music training and performance. The Sound of Music would be a perfect example of a work that is both a music story and a musical. Compare Rockumentary and Concert Film. See also Cooking Stories. BanG Dream! : Short of "Band Girls' Dream". Features covers of famous anime songs. Tsukipro/Tsukiuta: Professional pop/rock units in their 20's, most of whom write their own songs. Slice of life, with occasional supernatural hijinks. Songs Uncle Sings is about the bonding and growth brought about by music. My Little Pony: Equestria Girls  Rainbow Rocks: Unlike the first movie or the main show, where the songs are of the spontaneous kind, this film and the preceding shorts are true music stories, depicting the Rainbooms' efforts and tribulations from forming a rock band and competing at the musical showcase, with some supernatural complications thrown in the way. Brassed Off — While it's more about the band members themselves and their lives in Northern England, the music is what keeps them going and they do enter a contest. One Night of Love — A young lady is so determined to make it as an opera singer that she moves to Italy. Swing Girls — A Japanese movie about a ragtag band of misfits who transition from ordinary high school students to a swing band playing at a music festival. Swing Kids — Not to be confused with the above. The Wall, the 1982 movie. Unusually, Pink's rise to stardom is glossed over; the movie instead focuses on his coming to terms with the way his life has gone. Whiplash, an Oscar-nominated 2014 film, is about a young jazz drummer that wants to be part of the most important jazz school of the city. Soul Music - which parodies just about every possible music trope, yet still qualifies. Classic Albums, a documentary series about music albums. Guitar Hero became this once Activision took over the franchise. Shinkyoku Soukai Polyphonica and its anime adaptations combine fantasy adventure with the music story. The main characters are Dantists, which are a mage-like group which uses music to influence supernatural spirits. Uta No Prince Sama and its anime adaptations follow a wanna-be composer and her relationship with her fellow classmates, all Idol Singer-hopefuls.